Carlos (Criterion) — Olivier Assayas’s globetrotting Carlos is among the most in-depth, fully-realized character studies in recent years, and not just because of its marathon runtime of five-and-a-half hours. 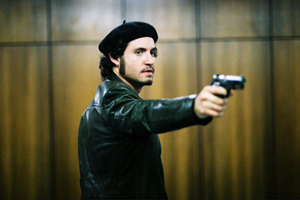 As the infamous title terrorist, Edgar Ramirez packs so many nuanced gestures—with his eyes, with his hands—into any given minute that we almost don’t need to hear him speak. And that’s just the beginning of Michael Nordine’s excellent review, the rest of which you can read right here. Available on DVD and Blu-ray . L’Amour Fou (MPI Home Video) — Available on DVD . The Phantom Carriage (Criterion) — Available on DVD and Blu-ray . Ben-Hur: 50th Anniversary Ultimate Collector’s Edition (Warner) — Available on DVD and Blu-ray . Extract (Miramax/Lionsgate) — Available on Blu-ray . Basket Case (Image Entertainment) — Available on Blu-ray . Mother’s Day (Troma) — Available on Blu-ray . Viva Riva! (Music Box Films) — Available on DVD and Blu-ray . 3 By Theo Van Gogh (Entertainment One) — Includes three feature films from the late Dutch filmmaker: Blind Date, Interview, and 1-900. Available on DVD . The Hour (BBC Warner) — Available on DVD and Blu-ray . Sounds and Silence: Travels With Manfred Eicher (ECM Records) — Available on DVD and Blu-ray . How To Make It In America: The Complete First Season (HBO) — Available on DVD and Blu-ray . Good Neighbors (Magnolia) — Available on DVD , Blu-ray , or through Amazon Instant (RENT ). Transformers: Dark of the Moon (Paramount) — Okay, who am I kidding. I have no desire to see this especially now that it would be on the small screen, but apparently Michael Bay is a misunderstood auteur genius so we should probably include him here, right? Available: 2-Disc Blu-ray/DVD Combo + Digital Copy .